This style gets its name from seventeenth-century Flemish painter Sir Anthony Van Dyke. When done right, the Van Dyke is downright artsy. Stop shaving for about one week. At this point, your whiskers will be shorter than necessary to achieve this style but you can begin shaping it, while keeping the rest of your face clean-shaven. Shave your cheeks clean, leaving your chin whiskers and mustache intact. 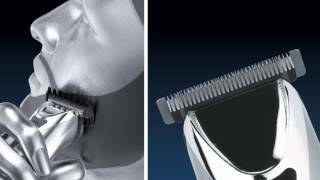 As your chin beard (Goatee) grows longer, use your Wahl® trimmer to carefully trim it into a pointed shape. Try not to trim too deeply into the beard or snip off the tip you’ve worked so hard to grow. Add some personality to your new look by twisting the ends of the mustache into points, applying a lightweight wax to maintain the shape.